Since the declaration of Sierra Leone as Ebola free two weeks ago, there has been a flurry of activity from the Koroma government – egged on by the IMF and the World Bank, to kick-start an ailing economy. 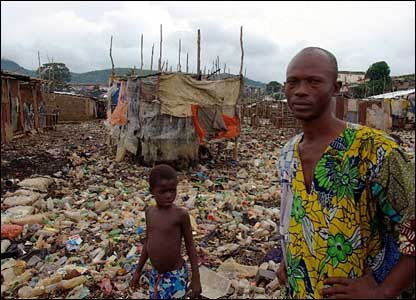 Sierra Leone’s economy is seriously ill and in desperate need of resuscitation. The economy is as much a victim of the Ebola virus, as it is the product of eight years of poor governance, poor leadership, misplaced priorities, corruption, and the lack of strategic direction. Foreign companies that were once thought of as the backbone and lifeblood of the government, have now turned out to be nothing but pawns in a corrupt game of monopoly. Take African Minerals Ltd, Sierra Leone’s jewel in the crown – the largest iron ore mining company in the country. Since going into liquidation before the start of Ebola, and then rescued by the parent company of the Chinese investment company that provided most of its investment capital in the first place, is still struggling to find its feet. The company was bled dry of cash by its previous owner Frank Timis, before being rescued by the Chinese. Addax Ltd., another of the government’s foreign investment flagship, has been run to the ground by its owners, under the watchful eye of the president and minsters. It is believed that the president and key ministers are shareholders of the company, and yet failed in their fiduciary duty to ensure due diligence. Addax is in serious financial trouble, with hundreds of millions of dollars of investment capital at stake, and is looking for a buyer. Last week it was announced that Koidu Holdings – another government flagship, the country’s largest diamond mining company, could close as it struggles to meet its financial obligations with the government and creditors. Other foreign companies are facing similar uncertainty, as government ministers turned a blind eye to years of lack of transparency, falsification of accounts, poor governance and financial impropriety. Ebola may have significantly eroded the government’s ability to generate revenue from taxes and duty, but its failure to manage the economy properly and provide good stewardship over the country’s natural resources, have had the greatest impact on the public purse. As a consequence, government borrowing in the last three years have risen by over 25% – to the dissatisfaction of the IMF and World Bank. 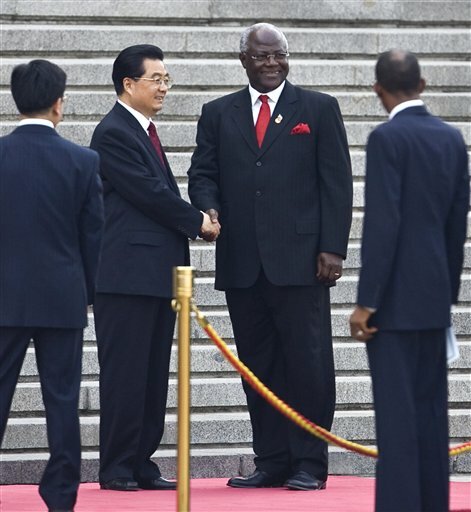 In 2013 president Koroma visited China along with ministers, and came back to Sierra Leone with a briefcase full of signed Memorandum of Understanding (MOUs) for large-scale Chinese investments in fisheries, agriculture, tourism, and electricity, worth over $10 billion. Two years on, those MOUs are still gathering dust on ministerial bookshelves. Despite this grim reality, president Koroma continues to present his so called Agenda for Prosperity as the blueprint for economic success. There is little substance behind the rhetoric, and certainly no coherent plan as to how he is going to kick-start the economy and end poverty in Sierra Leone, as promised eight years ago. Critics say that by relaunching his pie in the sky Agenda for Prosperity last week, the president was merely pouring old wine into a new bottle – nothing has changed, and nothing will change, until the government is replaced in 2018. Following the tremendous progress in implementing the Agenda for Change (2007 –2012), we embarked on the preparation of the Agenda for Prosperity (2013 – 2018). Prior to this exercise, when Sierra Leone turned 50 in 2011, I constituted a Committee on Development and Transformation, charged with the responsibility to take stock of the progress we have made as an independent nation over the last 50 years and to chart the way forward for the next 50 years. The Committee organised the Sierra Leone Conference on Development and Transformation, which came up with a number of outcomes; key among them is the aspiration of Sierra Leone to become a middle income country by 2035. In keeping with the aspiration of our people, we commenced work on the Agenda for Prosperity as the first five-year road map towards this forward march. The Agenda for Prosperity builds on the successes of the Agenda for Change and lays the foundation for our journey to achieving sustainable future for all Sierra Leoneans beginning with our goal of middle income country. We are mindful, however, that achieving this goal requires tackling several challenges: for example, whilst we have reduced poverty from 66.4 percent in 2003 to 52.9 percent in 2011, we need to do more, such as to address unemployment, particularly among the youth. We need to better manage our natural resources for the good of all Sierra Leoneans, we need to add value to our primary products, we need to extend, expand and sustain the Free Health Care and Scaling-Up Nutrition initiatives, reform the education system to meet the emerging needs in the job market, we need to finish on-going projects in roads, energy and water supply. We need to build the much needed infrastructure, including the new mainland airport, railway, roads and ICT capabilities; provide a social safety net for the vulnerable population; promote good governance; ensure that the public sector is capacitated to deliver; empower our women and ensure equal opportunities for both men and women; and above all, we need to maintain our zero tolerance to corruption, and provide the enabling environment for the private sector to thrive. My Government is committed to accelerating the eradication of hunger and malnutrition, with a strengthened focus on women and children from conception to two years of age, to prevent the irreversible effects of stunting. We will establish a multi-sectorial nutrition coordination secretariat to address these issues. It is against this backdrop that the Agenda for Prosperity has been prepared to complete residual projects in the Agenda for Change and to address these challenges. We hope to draw on lessons learnt and to merge innovations with the strong economic growth we have recorded in the last five years, but we must ensure that we are globally competitive and our economy is diversified to promote inclusive green growth that is beneficial to all Sierra Leoneans and to keep the growth spirit sustained. No doubt implementing the Agenda for Prosperity will require concerted efforts,collaboration and coordination among Ministries, Departments and Agencies (MDAs), especially implementing MDAs. Emphasis will be placed on monitoring of projects to ensure that results are achieved on timely manner. We will continue to attract foreign direct investment by forging strong partnerships with the private sector both local and international especially on large scale projects. Consistent with the principles of the New Deal for engagement in Fragile States, the Agenda for Prosperity is the country’s one vision and one plan. Its implementation will be guided by strong commitments by Development Partners as well as the Government. In this regard, Government is developing a mutual accountability framework that will be jointly monitored and reported on. Our goal is to strengthen the partnership between Government and Development Partners as well as ensuring that the voice and opinion of each and every Sierra Leonean is heard in the implementation as was done through wider consultation in developing this national plan. As we embark on this epic journey to become a middle income country, let me remind fellow Sierra Leoneans that we have together – Government and every stakeholder – committed ourselves to change, because prosperity does not pour like rain, and will not come to us, but we must go in search of it with determination. We must sweat it out with our hands, with our brains and with our minds. Our Agenda for Prosperity marks an end of the chapter of business as usual, and the dawn for a new Sierra Leone that have set out to embrace the values of innovation, of cultural renewal in the workplace and respect for public goods; and the realisation that the end results of this new beginning is the extent to which we double our efforts, and commit ourselves to the values of self-reliance and discipline. I am very optimistic that with the support and collaboration of every Sierra Leonean and our partners, the implementation of the Agenda for Prosperity will be a huge success. The Sierra Leone Telegraph asks: Where is the detailed Plan for the implementation of this Agenda, if it is not mere wishful thinking? I’ve been doing some research on Sierra Leone and I wanted to get a few personal perspectives on the current state of the country. My research is centered around any environmental issues that are hindering the development of the country. I understand that there are many environmental issues that the country is dealing with but do you think those issues are properly assessed with the current government officials running the country? Do you believe the government really cares about the welfare of the country? Do you personally care about environmental issues within your country? I understand the answer isn’t a simple yes or no, but I’m trying to get some insight from anyone living within the country. I would greatly appreciate it if I could get your opinion, which I would love to include in my paper. I am currently attending a school in California and this is purely for information purposes only. Agenda for Change! Agenda for Prosperity! When one hear these words that the current government uses to name its economic development projects for the future of our country, it reminds one of image making and focus group words that sell products at face value and not for their underlying fundamentals. In other words, it is purely a marketing ploy to present a good image to the public, and portray an image of seriousness, when in actual fact everything is a show. I say this because the so called Agenda for Change is the Poverty Reduction Strategy Paper 2 (PRSP 2) – a continuation of the interim Poverty Reduction Strategy Paper (IPRSP) that was initiated by the out gone SLPP government of late president Kabbah. PRSPs are serious development papers put together by a country, in collaboration with the International Monetary Fund (IMF) and the World Bank with serious strategies in place to eliminate poverty, especially for countries coming out of difficult socio-political turmoil and crisis, such as wars and natural disasters. As a result, the Kabbah government with both the IPRSP and PRSP1 succeeded in building the socio-economic and political institutions that put our country on the right development trajectory for the remarkable results that the SLPP achieved during its time in office. They were able to redeem our country from a failed state to one with remarkable prospect for long-term stability and growth, through effective implementation of IPRSP, PRSP1 and the initial implementation of PRSP2. Moreover, president Kabbah was able to achieve this feat with the able technical and professional help of people with sound knowledge in Development Economics. He appointed Dr. Sheku Sesay, a seasoned politician and development economist as presidential adviser on economic affairs, and thus the structural change and development of institutions that were signature achievements of the Kabbah government. To add a capstone to these achievements, a long term economic plan was put in place with serious input from our international partners, local as well as international stakeholders in a document called Vision 2025. Vision 2025 was among others, characterized by the desire to create a better future for our country through participatory democracy and the elimination of the vicious circle of poverty and underdevelopment and replace it with a virtuous circle of peace, stability and wealth creation. It was based on sustained growth and human resource development, and the attainment of a competitive private sector led growth with indigenous participation. Lastly, its aim was to build and create a high quality of life for all our people, through a well educated and enlightened society. 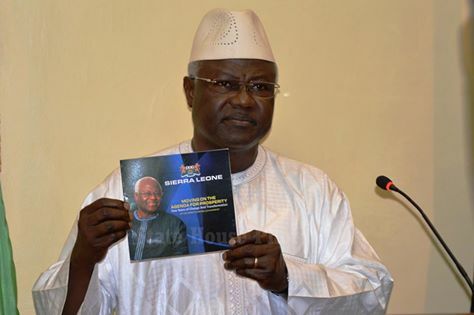 This remarkable document was thrown into the trash upon the assumption to power of the Koroma government, and replaced with this shambolic document known as Agenda for Prosperity. The misfortune and hollowness of this charade is that all the structures and institutions that were put in place for economic take off of our country was replaced by platitudes and high sounding slogans like “Attitudinal Change”, “Open Government Initiative” to name a few. The planning that should have taken place for diversification of our economy to play the role for transformational growth is absent, and all we saw were quick fixes leading to high level corruption, and economic devastation we are seeing in Sierra Leone today. To make matters worse, there is not a single development expert or economist around president Koroma to advise him on the type of economic framework that is necessary, for poverty elimination and sustained economic growth and prosperity as postulated by the Agenda for Prosperity. Instead of appointing serious economists on these matters, you have deal makers and worse, former Wall Street deal makers around him. Are we therefore surprised with the results they are getting? The answer is a big no. The Agenda for Prosperity was not built on sound policy initiatives, and it is not a surprise that it is crumbling in front of our eyes. May God touch President Koroma’s heart that he LISTEN to the real people – Not RICH HIGH CLASS PEOPLE, the RESIDENTS of Sierra Leone who have SUFFERED WAR, LOSS OF LOVED ONES, LOSS OF EVERYTHING. My heart bleeds when I see the sight of KROO BAY. Please, choose a land far away, dig up a large pit, and empty ALL those rubbish, burn it, then cover it for some years. I am trying to help in Kroo Bay, but my cousin in Freetown who is in charge, have still not got hold of the Community Leader of Kroo Bay. Please email me with someone’s details. God bless you ALL. I think the reason why the All Peoples Congress (APC) government of the day under the management of President Ernest Bai Koroma is having continuous problems with the “Agenda for Prosperity” is that the idea did not originate from either President Koroma or a member of the APC political party. It is a stolen idea from Julius Maada Bio, who decided to shut his mouth to see how President Koroma struggles to deliver the package. And after finding that he (President Koroma) had no idea of how to operate the system, he felt shy and proud to invite Julius Maada Bio to explain how to go about it. This is why the failure to take this project off the ground is always impossible and the APC government continues to struggle with it. We will wait to see them struggle with their “wa-ha-la” and lies until they are clearly uncovered by the voters very soon. Although Julius Maada Bio is a younger person to President Ernest Bai Koroma, Julius Maada Bio possesses state management techniques. President Ernest Bai Koroma should learn from Bio. David was a small boy in the mountain when the Almighty God anointed him to kill Goliath and eventually become King of Israel. Although Maada Bio’s votes were highly rigged in the last election, David is coming soon for Goliath and I can hear the swinging of the sling in the air. I am at a loss that Mr Sannoh does not appear to share Mr Bio’s judgement that the Government of Ernest Koroma is an “effective government”. I am left wondering why, if Mr Bio perceives that the APC government is effective – that we can rely on him to deliver on an Agenda for Prosperity. Mr Sannoh refers to Mr Bio’s “State Management Techniques.” Public sector bureaucracies are never engines for economic growth and development, and certainly, the bloated, inept bureaucracies and rudderless bureaucracies in Sierra Leone are light years away from being successful engines for economic growth. So I struggle with the idea that someone who has no track record in business or in any meaningful employment over the past 20 years, somehow poses the “State Management Techniques” that Mr Sannoh believes Sierra Leone needs at this time. As a nation, we would collectively be taking leave of our senses if we consider a long term unemployed person to be worthy of the highest office in Sierra Leone. What Sierra Leone needs is Kandeh Kolleh Yumkella for President in 2017! !